Sling TV has launched a new ad campaign, introducing Slingy, a puppet that “is here to help you cut the cord – wherever you are”. One of the spots included in the campaign, created by The Martin Agency, features a woman at the office asking a colleague if she’s into slinging. The latter, looking quite shocked by the question, is left speechless. At this point, Slingy shows up and explains to the young woman that “slinging lets you choose the channels you want without the ones you don’t”. When another coworker joins the conversation, asking if that’s a puppet (referring to Slingy), Slingy replies “You’re a puppet!”. According to the OTT service, Slingy was designed and created by Tim Clarke, one of the masterminds behind “The Muppets” puppet design. “Slingy is on a mission to let everyone know that Slinging is easy and anyone can do it – even a puppet!” Sling stated. 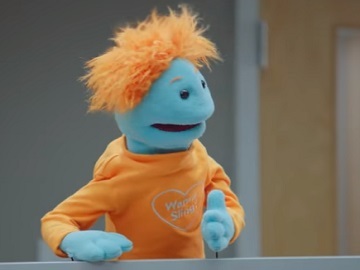 The cute puppet, which is featured in several ads, is described as “passionate about educating live TV lovers who want to cut the cord”. “After a visit from Slingy, consumers can’t help but get excited about the choice, flexibility and control that Sling TV offers without the baggage that comes with cable,” Sling TV also says. Last year, the celebrity couple Nick Offerman and Megan Mullally fronted the service’s TV campaign, taking on the role of “slingers”.